The following two blogs excerpted below were recently posted by the Western Center for Agricultural Health and Safety (WCAHS), both related to the impacts of increasingly intense and frequent heat events on farmworker health and working conditions. 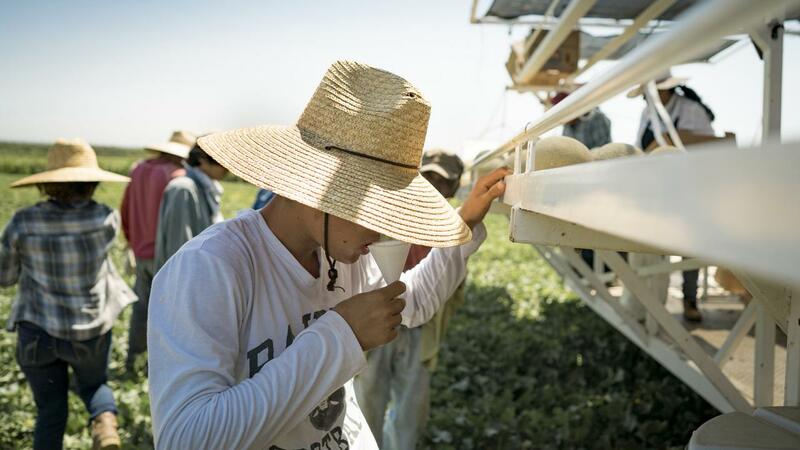 Avoidable deaths and heat-related illnesses still occur among California farmworkers despite regulations from the California Occupational Safety and Health Administration (Cal/OSHA) and a campaign to encourage drinking more water and taking more rests in the shade. The California Heat Illness Prevention Study (CHIPS) aimed to provide new data to quantify the physiological and behavioral risk factors for heat related illness (HRI) and develop the findings to produce more effective workplace strategies to reduce risk. As summers are predicted to become increasingly hot, the conclusions and translation of findings from this study will only become more important to the 800,000 farmworkers in California. If workers stop work to drink more or visit the bathroom, they reduce their productivity. On the one hand, this will materially affect their earnings if they are being paid by the piece. On the other, there is concern for their job security as workers are very aware their employer wants to have workers who can maximize productivity, no matter how hot the weather. These two factors suggest that though employers may encourage workers to drink and rest, their employees may not respond to the offer. Read more about training methodologies and resources the WCAHS plans to produce. Farming doesn’t stop just because the sun sets. Across the West, a variety of crops are harvested at night, such as wine grapes, tomatoes, onions, garlic, and corn. Harvest, equipment transportation, set up, and maintenance as well as field prep and repairs, irrigation work, and pesticide application are other activities done at night. The general, unofficial consensus among a number of professionals involved in agriculture is that night work is increasing. Possible reasons include rising temperatures and heat illness prevention regulations, increasing labor shortages, product quality and taste preferences, time-sensitive harvests, and avoidance of pests. “The area’s cool nights create better working conditions—not only is the temperature more tolerable, but bees and rattlesnakes stay away at night” explains Lino Bozzano, VP of Vineyard Operation, in the Laetitita Vineyard and Winery blog, “Why We Harvest Fruit At Night.” Head Winemaker, Eric Hickey adds that “grapes are firmer, making them easier to work with.” Currently, very little quantitative information is available on night work in agriculture, such as how many growers have adopted the practice, the kind of work being done at night versus the day, and how growers address nighttime health and safety risks. While more growers may be adopting nighttime work, there is concern that insufficient awareness of the hazards associated with night work puts agricultural workers at risk. 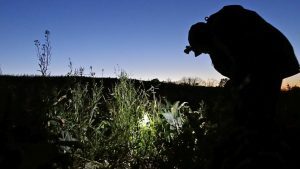 Many safety risks of night work in agriculture are the same as the risks of daytime work, but they may be exacerbated by night conditions, such as limited visibility due to poor lighting or fatigue due to the disruption of biological rhythms leading to trips, falls, or collisions. Other risks include greater exposure to nocturnal animals and even criminal activity if lighting is poor. Night shift work has been shown in construction and hospital work to negatively affect health, including interruption of hormone release cycles, low immune response, cardiovascular disease, and miscarriage. The disruption of family life and social activities can lead to poor diet, stress, and lack of exercise. This is especially true if workers are picking up a second shift or working longer hours. WCAHS is working to define specific research questions that can shed light on this issue so that both growers and workers can safely benefit from the change in traditional work hours. Answering the questions of how and why night work is increasing will likely have significance for labor, agriculture, and health policy. WCAHS encourages investigators to apply for small grant funding from our center to explore these issues more deeply.